There are products on the market that you can use to dry your hair with, that either come in a spray or a fine powder that you can apply directly to your hair. They were created to be used between regular shampooing if your hair became oily and you didn't want to wash your hair more than once a day, or if you woke up late and you didn't have time to take a shower. These powders or powder-sprays soak up the excess grease on your scalp and may even leave behind a pleasant smell if they contain a fragrance. Some of the powders might leave behind a visible white residue, but some of the dry shampoos come in different colors that will blend into your hair, such as a brown powder for brunettes. These shampoos also vary in the ingredients they contain. Some contain fragrance and others don't, and many of them contain plant extracts that are supposed to be beneficial to your hair and scalp. Using these dry shampoos will turn out to be messy if you aren't careful when you apply them. 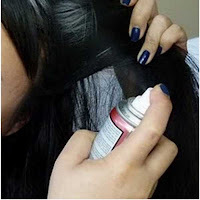 Do not dump the powder straight on your head--instead, pour some into a small bowl, dab your fingers in it, and apply the powder to the oil parts of your hair, which may be in the front on your bangs, or where your hair parts at the scalp. Let the the powder soak up the oils in your hair for about 10 minutes, and brush it out with a wide paddle brush. This method works for the powder shampoos that you sprinkle, but there is also the kind that comes in an aerosol can that you spray onto your roots, just like regular hairspray. The main ingredient that these dry shampoos often contain isn't some exotic ingredient, in fact, you may already have it in your kitchen cupboard. Cornstarch absorbs the oils on your scalp and will absorb any odors such as cigarette smoke. If you are in a pinch, cornstarch, cornmeal or white flour will work. Apply these powders to your hair the same way that you would with the powdered shampoo. Use them carefully and sparingly. Avoid using baby powder that contains talcum powder, which isn't healthy to inhale and since you would be using it on your head, there is a good chance you would breathe some in.